Back in late 2018, the long-time bearish analyst team at Wells Fargo upgraded Under Armour (NYSE:UAA, NYSE:UA) stock to “Market Perform”, citing declining clearance sales, strengthening marketplace inventory, restructuring earnings-per-share benefits in 2019 and relatively low Street expectations as reasons why the worst was over for UAA stock. I immediately responded with an article saying that they were wrong, and that worst was not over for UAA stock just yet. At the time, Under Armour was a $24 stock. By Christmas Eve, UAA stock had plunged 30% to below $17. In retrospect, Wells Fargo was clearly premature in its upgrade back in early December. Now, in late January, I think we have another premature bullish upgrade from Wall Street. This time around, Goldman Sachs is upgrading UAA stock to a Buy rating, citing significant margin improvement as being the fuel for a rally toward $28. This upgrade seems like a classic case of shooting behind the duck. The reality is that the time to buy UAA stock was back in December, when the stock was hovering around the $17 range. Since then, the stock has rallied more than 20% to back above $20. Now, it’s time to take profits, not buy more. Why? Because while UAA stock may see $28, it likely won’t see that price tag until four or five years down the road. Today, $20 is fair value on UAA stock, meaning that the late December and early January rally is more an opportunity to take profits than anything else. One of the worst things you can do in the stock market is shoot behind the duck. That means buying a stock that has already had its day in the sun, or selling a stock whose worst is already in the rear-view mirror. Not shooting behind the duck is much easier said than done. It’s tough to distinguish between buying into a stock on an uptrend that will continue on an uptrend, and buying into a stock on an uptrend that is about to reverse course. In order to distinguish the two, you have to look at the fundamentals. When you do that with UAA stock, it becomes clear that buying here is shooting behind the duck. The Under Armour brand seems to have already had its day in the sun. A few years ago, the brand was flying high on optimism regarding an operational breakout in the basketball market through the parabolic rise of NBA superstar and Under Armour athlete Stephen Curry. But, Curry has since lost popularity. So have Under Armour’s other athletes like Jordan Spieth. Consequently, the whole brand rapidly lost relevance, and revenue growth and margins went in reverse. Meanwhile, competition from Adidas (OTCMKTS:ADDYY), Nike (NYSE:NKE) and Lululemon (NASDAQ:LULU) has picked up. Those brands have successfully grown mind and market share through turning into iconic lifestyle brands. Under Armour hasn’t made that pivot, and as such, it is losing its mind and market share. Brand value has also been diluted by management selling more aggressively through low-price channels like Kohl’s (NYSE:KSS). Overall, Under Armour’s growth narrative is largely broken. To be sure, the international business has runway, North America growth is stable and margins have room to meaningfully improve over the next several years. But, that’s already priced in. UAA stock trades at more than 60X forward earnings, which is about double Nike’s valuation, and Nike is growing revenues at a faster rate. Thus, buying into UAA stock after a 20%-plus rally seems more like shooting behind the duck than buying into a long-term winner. My five-year outlook for Under Armour stock is fairly straight forward. During that stretch, the North America business will stabilize thanks to the company’s focus on the performance category and wider reach through lower price channel distribution. Meanwhile, the international business will continue to slow as other brands like Lululemon steal international share. Margins will improve from today’s depressed base. But, they won’t get back to peak levels because of diluted brand value, relevance and popularity. Overall, this is a stable growth company with mid-single-digit annualized revenue growth potential and healthy margin drivers over the next five years. That combination should drive EPS to $1.15 by fiscal 2023. Using a historically normal Nike-forward multiple of 25, that implies a fiscal 2022 price target of just under $29. Discounted back by 10% per year, that equates to a fiscal 2018 price target of ~$20. We still aren’t at the end of fiscal 2018 for Under Armour (fourth-quarter earnings are due in February). Thus, $20 feels like fair value for now. Given slow growth, a big valuation and operational headwinds, this isn’t the sort of stock you buy and hold forever. Instead, UAA stock should be bought on big dips and sold on big rallies. Right now, UAA stock is on the heels of a big rally. As such, this is the time to take profits. As of this writing, Luke Lango was long NKE and LULU. 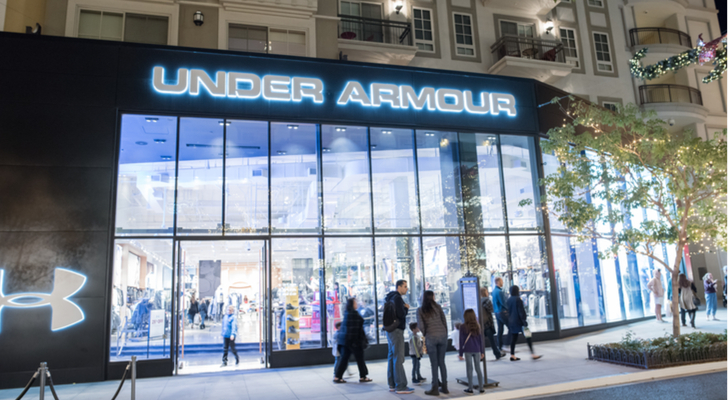 Article printed from InvestorPlace Media, https://investorplace.com/2019/01/take-profits-on-under-armour-stock/.